The Be Mine Sign is made in our workshop. The sign is mostly pink with a white edge. The letters are written in a darker pink color. When you face the sign, it has a dove in the left corner and a rose (or Valentine Flowers) in the right corner. The dimensions for the Be Mine sign are 9.5 inches tall by 14 inches wide by 2 inches deep. The sign has a 36" stake. It weighs approximately 2 pounds with packaging. For the continental U.S. shipping and handling is included in the listed price. For shipping outside the continental U.S. please contact us through our Contact Us page. The Cupid Sign is made in our workshop. The Cupid sign has a young boy with a bow and arrow. He has white wings and a blue garment. 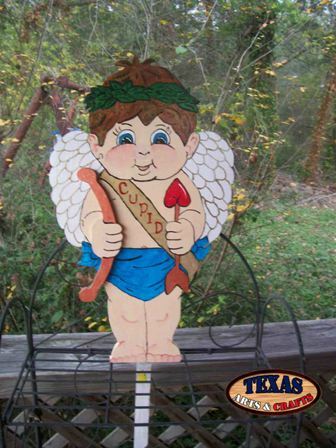 The dimensions for Cupid are 23 inches tall by 13.50 inches wide by 2 inches deep. The sign weighs approximately 3 pounds with packaging. For the continental U.S. shipping and handling is included in the listed price. For shipping outside the continental U.S. please contact us through our Contact Us page. 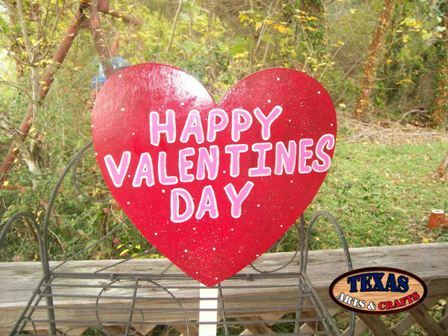 The Happy Valentines Day sign is made in our workshop. The Happy Valentines Day sign is a red heart with Happy Valentines Day written on it in pink lettering. The dimensions are approximately 23.50 inches tall by 23.50 inches wide by 1.50 inches deep. The sign weighs approximately 5.50 pounds with packaging. For the continental U.S. shipping and handling is included in the listed price. For shipping outside the continental U.S. please contact us through our Contact Us page. A Rose For My Love Sign is made in our workshop. The sign has a red background with white frilly trim. The lettering is in pink and there are red roses (or Valentine Flowers) to the left and right. The dimensions are 12 inches tall by 10 inches wide by 2 inches deep. The sign has a 36 inch stake. The sign weighs 2.25 pounds with packaging. For the continental U.S. shipping and handling is included in the listed price. For shipping outside the continental U.S. please contact us through our Contact Us page. The Be My Valentine Sign is made in our workshop. 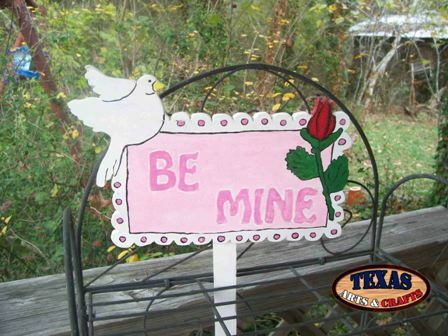 The Be My Valentine sign is a red heart with doves on the top. The sign has pink lettering. The dimensions are 13 inches tall by 10 inches wide by 2 inches deep. The sign has a 36 inch stake. It weighs approximately 2.25 pounds with packaging. For the continental U.S. shipping and handling is included in the listed price. For shipping outside the continental U.S. please contact us through our Contact Us page. The Candy Hearts Signs are made in our workshop. The Candy Hearts come in a set of three. The Candy Hearts come in a variety of colors pink, yellow, green, orange, purple, and blue. Some of the valentine sayings that are written on them are Be Mine, Best Friends, Love You, Hug Me, Friends Forever, My Love, Too Sweet, Kiss Me, I'm Yours, Cute Stuff, and Two Hearts. You can also have a custom saying as long as it is appropriate. If there is not enough space to type in the custom sayings and color please contact us through our Contact Us page. The dimensions are 4.50 inches tall by 4.75 inches wide by 1.50 inches deep. The hearts are on a 20 inch peg. The signs weigh 1.75 pounds with packaging. For the continental U.S. shipping and handling is included in the listed price. For shipping outside the continental U.S. please contact us through our Contact Us page. The Happy Valentines Day With Rose Sign is cut out in our workshop. The heart is hand painted red with frill around the edges. The sign has a rose (or Valentine Flowers) at the top of it. The lettering is in pink. The dimensions are approximately 12.50 inches tall by 11.75 inches wide by 2 inches deep. The sign has a 36 inch stake. It weighs approximately 2.25 pounds with packaging. For the continental U.S. shipping and handling is included in the listed price. For shipping outside the continental U.S. please contact us through our Contact Us page. The Hugs and Kisses Sign is made in our workshop. The sign has a red background with a white frilly border. The lettering is in pink. The sign has doves in the top corners. The dimensions are approximately 8.75 inches tall by 17 inches wide by 2 inches deep. The sign has a 36 inch stake. The sign weighs approximately 2.75 pounds with packaging. For the continental U.S. shipping and handling is included in the listed price. For shipping outside the continental U.S. please contact us through our Contact Us page.